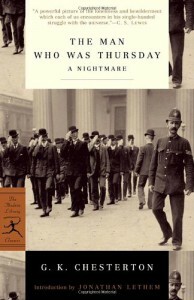 I liked this novel well enough, and would recommend it, but I nevertheless liked Chesterton's other masterpiece, The Napoleon of Notting Hill, better. This is a strange and mysterious story, with the battle against the anarchists being largely intellectual. I didn't understand the last chapter very well.